. Komuso begging monks 虚無僧 . The shakuhachi is certainly Japan's most well-known woodwind instrument. A ertically-held bamboo flute, it is made from the very bottom of a bamboo tree. Bamboo is hollow except for this nodes which are spaced at Intervals along the pipe. These nodes are knocked out to form the complete hollow length of the pipe. Four fingerholes are put on the front of the instrument and a thumbhole on the back. The mouthpiece is the open top of the pipe itself with the front side cut at a slight and angle to facilitate blowing the instrument. Although the placement of holes and tuning of the instrument is a very delicate process, the instrument itself is of a basically simple construction. It is this very fact, however, which allows for very complex techniques in playing the instrument such as the use of the breath with changes in the blowing angle for great or minute changes in sound quality, or partial-holding of fingerholes to make delicate pitch changes. The instrument takes its name from its standard length of one foot (shaku) and eight (hachi) parts of a foot (called sun), approximately 54cm. There are other lengths of the instrument as well, all with the general name of shakuhachi. 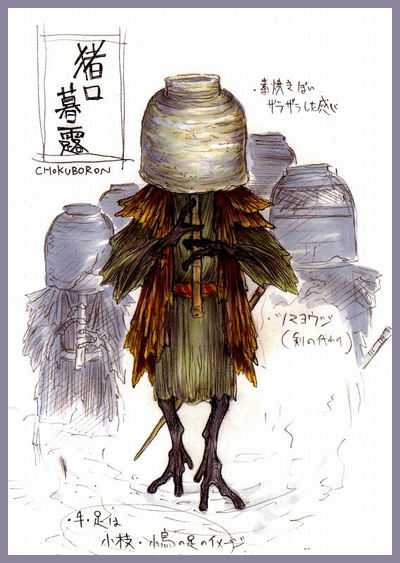 Fuuketsu doosha , the Person of the Way of the Wind and Holes. He also was the founder of the komusoo temple in Kyoto, Myooan-ji or　Meian-ji, and the same person also known as Kyoochiku Zenji. Donkoro spinning top for gambling . It has the images of symbols of good luck to make a bet on. 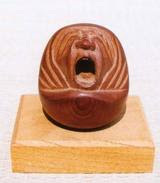 四だるま Daruma san 五虚無僧 Komuso monk、六西行 poet Saigyo. Gamblers bet on one side to come up as top and if it does, they get their money back about sixfold. 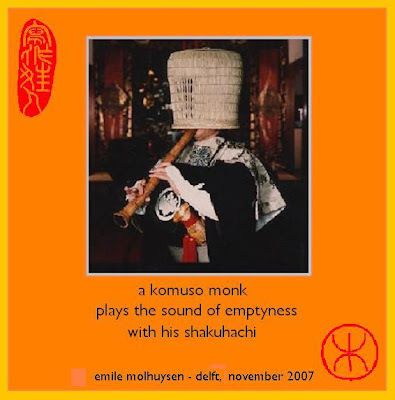 The end-blown bamboo flute, the shakuhachi, is another noteworthy solo instrument. It first developed under the influence of Zen priests, with new schools of performance growing up from the 16th to 19th centuries. He lives in a little village in the backwoods of Kyoto. 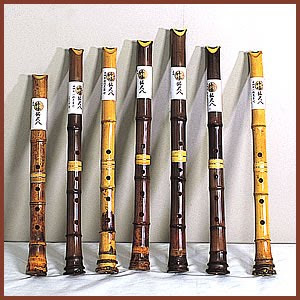 The Shakuhachi flute has been traced back as far as ancient Egypt and is thought to have migrated through India and China before being brought back to Japan by monks who were studying abroad in China during the 6th century. The Fuke Sect of monks was dissolved around 1871 when the Tokugawa government fell and the Meiji Restoration began. Because of the special arrangement the Fuke Sect had with the Shoguns the Meiji would not honor the Fuke sect in order to weed out and eliminate spies and the Shoguns holdouts. 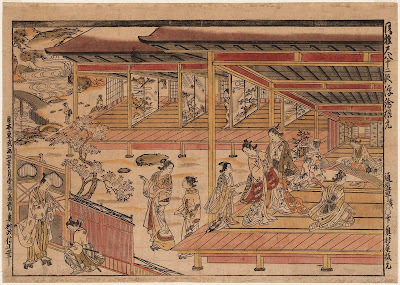 The playing of the shakuhachi became forbidden and its use went underground. When the Meiji government did permit the use of the shakuhachi again it was played as an accompanying instrument to the shamisen and koto. Many of the honkyoku and important documents were lost during the hiding. It wasn't until 1883 in Kyoto, Japan that the shakuhachi was revived by the Myoan Society at the old Fuke Temple, Myoan-ji. 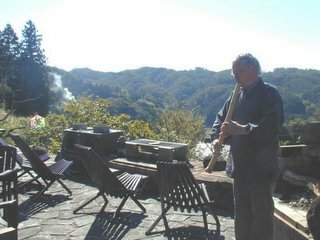 This society is responsible for much of the traditional shakuhachi music we have today. Startling me from a deep, melancholy dream. [from Ikkyu, Zen Master. Wild Ways: Zen Poems of Ikkyu. Aufgeschreckt bin ich aus einem tiefen, melancholischen Traum. first you must know this ! Written in 延宝5年. Basho age 34. The cherry blossoms of Yoshino are famous for "haha no fubuki" cherry blossoms scattering like snow. was a famous Shakuhachi flute player. A monk of the Rinzai Sect Musoo 夢窓. Also called Hanin 半隠, Taishoo 対松. 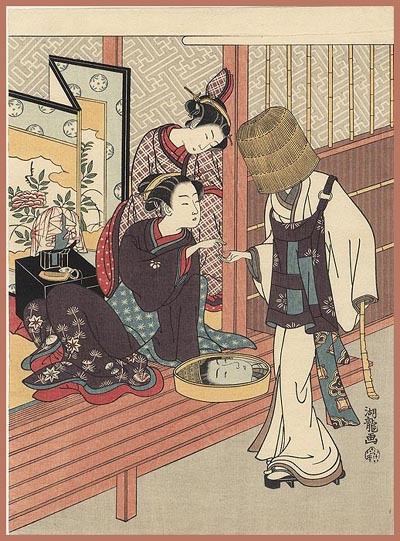 The shakuhachi at his time was a famous Hitoyogiri 一節切. One of his famous tunes was "Yoshinoyama". It was quite a hit in the Edo period and made Basho think of Yoshino.
. Mount Yoshino and more haiku about Gichiku . 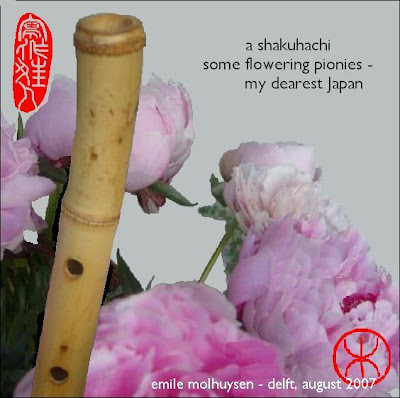 summer's day- a duet of frog and shakuhachi! Glenn lives near asama yama, close to a fudo-son waterfall in karuizawa called sengataki. ***** . komusoobana 虚無僧花 "komuso monk flower" .
. komusoo 虚無僧　説 Komuso legends about begging monks . little monster wearing a 猪口 Sake cup as Komuso hat. I'm from the Philippines and I was amazed with the fact that even a Japanese bamboo flute looks simple in appearance but it is actually very difficult to play. I've read that if plays by the master this Shakuhachi Flute create an amazing, subtle, sensual music - prized as being perfect for meditation and relaxation. It’s beautiful, soulful sound made that best hear when you are taking a good rest or about to sleep.